Although I was running toward the trailer at top speed and swatting at my breasts, I still had the presence of mind to grab those two full frames of honey. My beekeeping mentor (aka movie star neighbor) had admonished me that, at this time of year, the frames need to go back on the hive ASAP. Within a couple of hours, he warned, bees will start building comb willie nillie to fill that empty space. So, even though I mostly felt like crawling into bed, I needed to extract our honey and open the mean hive back up. I iced my wounds, but my head wasn't quite on straight when I got to work on the honey. In fact, this post really should be called "how to do everything wrong while extracting honey." I hope you'll learn by seeing the error of my ways. Step 1: Remove the bees from the honey. I actually managed to do this step well, moving the frames a good distance from the hives (which calmed the bees down), then gently brushing one frame at a time free of bees. Step 2: Uncap the honey. Here's where I failed miserably. For future reference, a plain kitchen knife will mangle your comb so that it falls apart in the extractor. A bread knife works great. Step 3: Extract the comb honey. 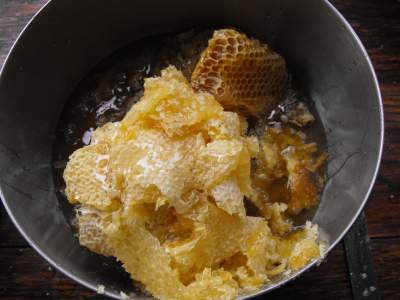 Place the cappings in a collander on top of a bowl and mash the wax with a spoon to let the honey begin to drain out. Step 4: Place a bowl under the spout at the bottom of the extractor. With the state my head was in, I'm surprised I remembered this step. Step 5: Extract. 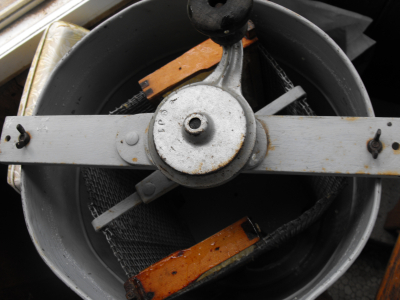 Place the frames in the extractor opposite each other so that they are balanced. With new comb like ours, it's best to gently spin the extractor a few times, then flip the frames around and fully empty out the other side of each frame, before flipping the frames a second time and giving the handle a few hard spins. My beekeeping mentor explained this to me in great detail, but when I tried the gentle spin, I couldn't see honey coming out (even though it was), so I spun harder. As a result, the comb on my mangled frame from step 2 fell apart, and even the other frame got a bit distorted. Step 6: Cut out the mangled frame to join the cappings. Oops. Step 7: Put the frames back on the angry, angry hive, along with an extra super since the bees are clearly making honey faster than we can extract it. Your hive won't be angry. Mine was because I made a mistake. Step 8: Pour the honey from under the collander and from under the extractor into canning jars for storage. 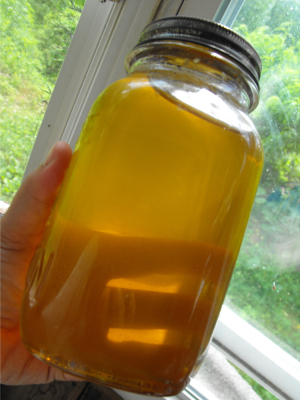 No need to can --- honey will keep indefinitely if harvested when fully capped and stored in an air-tight container. Some people strain the honey first to remove the little bits of wax, but I didn't bother. Step 9: Taste a bit of honey. It was all worth it! I'm actually glad I tried a couple of frames before embarking on a larger extracting expedition. Now I'll know what I'm doing this week when we remove a gallon (!!!) from the hive. 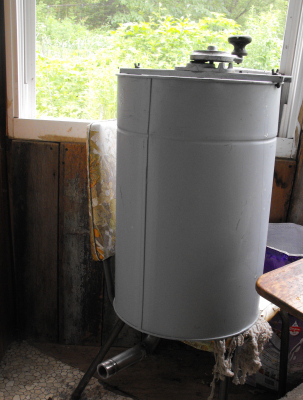 Our homemade chicken waterer is perfect for tractors and coops. FYI- for that beautiful jar full of honey in your hands...we pay $15 at the farmers market! Then we're up to $75 after today's harvest (not counting all of the money we've put into the startup costs, which was actually not much since we got that extension service grant.) It sure is tasty!